Cancerians are usually very sentimental, sensitive and intuitive by nature, and your life as per 2019 Cancer horoscope may turn out to be really productive for them as matters related to finance, career and job is going to take a positive leap. Therefore, those who have a job will be appreciated and promoted, as your hard work and capabilities will lead you through the way and bestow you with the taste of success, confirms Ganesha. For all the businessmen, you may get good opportunities to make new clients or implement something new, which will be favorable and advantageous for you, monetarily. You may also get a chance to enlarge and develop your business on a bigger scale and achieve a state of prosperity. The only thing that you have to make sure is to plan your moves and implement it accordingly which will assure your victory. As far as the subject related to love is concerned, two periods right from, January to March and October to December is the best time to involve yourself in a relationship. Those who intend to get married, will also find this the best suitable time to get into the association of marriage, as per Cancer 2019 horoscope. For Cancer in 2019, there is a high probability that you will either buy a new vehicle or a house this year, or if your plans to sell your property were not successful previously, this is the time to try your luck as the chances are pretty good. You will also be able to finish any renovation work left at your home and make your house a much better place to reside in. In terms of your relationship with your family, you will notice that you form a great bond and rapport with your family, which will make you feel contented and gleeful. The aura and the environment in your house will be very energetic, optimistic and cheerful, making you feel all the more blessed and delighted, according to Cancer life in 2019. Furthermore, there may be an addition to your family member, creating a perfect mood to relish the moments, during this time. Unfortunately, you may not be able to spend as much time as you wish to, as work will demand a lot from you and keep you busy, in accordance with the Cancer 2019 predictions. According to the Cancer 2019 yearly horoscope, all the students this year who is focusing on studying, this is the time to utilize all the resources and give your best shot with constant serious efforts to yield good results. One thing to accept and reflect upon during this time is, to not stop working hard, as continued hard work will always pay off and everything is achievable when you give your heart and soul to it. People who are opting to give competitive exams will also benefit, especially after the month of July. For those who are planning to pursue higher studies or thinking to go to abroad, will find this time to be in favor of them. Thus, your dreams may shape itself into a reality with hard work and perseverance, says your Cancer horoscope 2019. 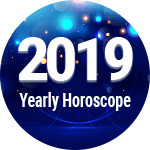 Cancer Horoscope 2019 Overall rating: 4.4 out of 55 based on 1368 reviews.